The open road evokes adventure, freedom and a hunger for discovery, a desire for unseen sights and experiences waiting to be savoured. Taking inspiration from wide, endless highways and the intrepid travellers who dare venture beyond well-trodden paths, progressive watch company Azimuth premieres it latest avant-garde creation, the SP-1 Crazy Rider. Off-kilter creations are a signature of Azimuth’s SP-1 collection, and the SP-1 Crazy Rider does not disappoint. The watch comes loaded with technical and design bravado, and true to its source of inspiration, exudes motoring pizzazz. The first thing that strikes you about the watch is its unusual case. Constructed to resemble a motorcycle engine, the case’s asymmetrical, infinity symbol-shaped profile sets the tone for the rest of the timepiece. Fitted with a porthole-style bezel with exposed screws, the SP-1 Crazy Rider invites the open to peer into its inner workings, akin to looking deep at the cross-section of an engine. A miniature chain circles the center of the dial, aided by open-worked wheels at both ends, this time evoking the look of a motorcycle’s sprocket brake drive system. 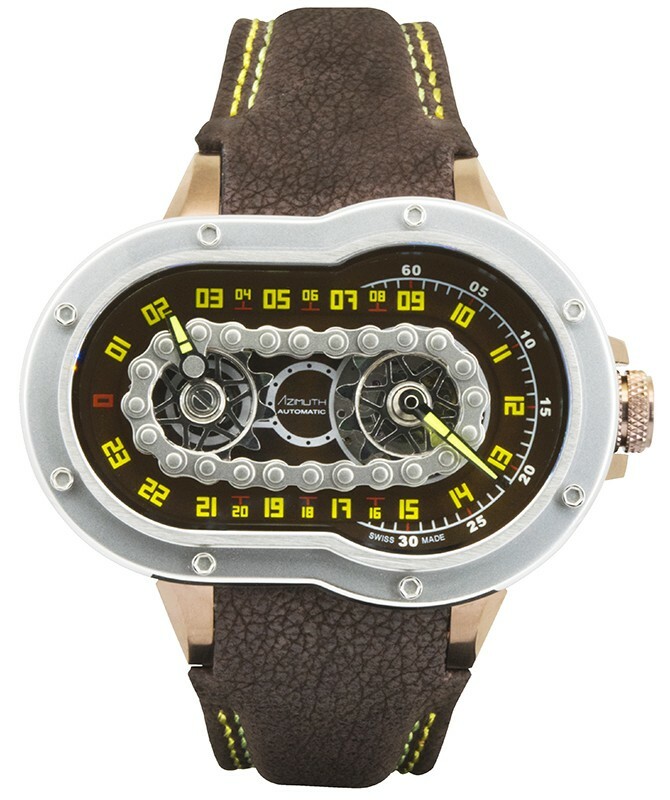 The ingenious chain transmission design, in fact, drives the hour and minute display. The shorter hour hand traverses along the entire dial, indicating time along a true 24-hour scale. Meantime, the minute hand rotates from a fixed position at right end of the wheel. The SP-1 Crazy Rider’s high-octane appeal extends to the back of the case. 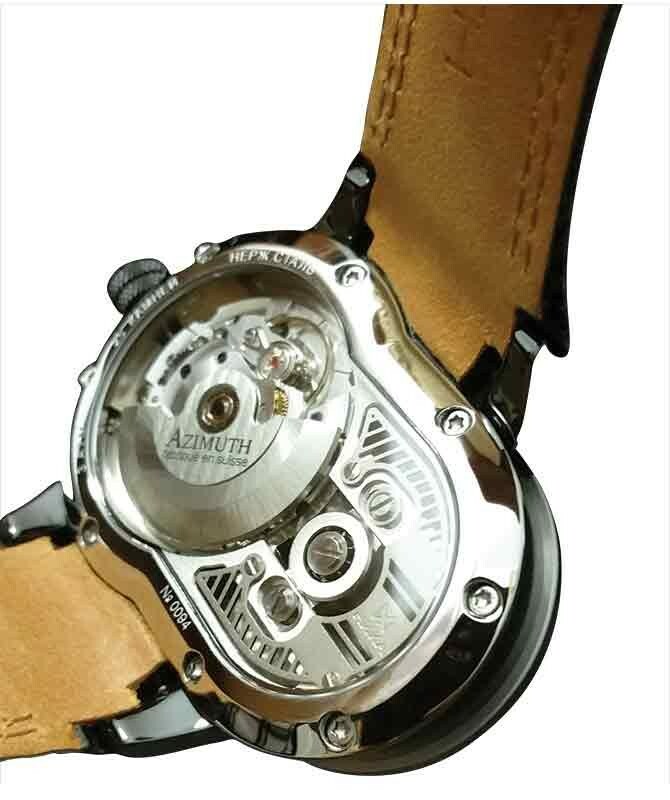 Flip the watch over and one gets an insight to how Azimuth has re-engineered the automatic movement to address the watch’s automotive inspiration. Just as it with the front of the watch, the open case back shows an artfully decorated movement meant to resemble an engine block. “We are fans of the 1960s movie Easy Rider, starring Jack Nicholson and Peter Fonda. I remember watching the film and getting inspired by its message of fearlessness and freedom, and we wanted to convey this through the SP-1 Crazy Rider,” says the creator of Azimuth. Paired with leather strap featuring contrast stitching that enhances the watch’s sportiness, the SP-1 Crazy Rider is available in small series each in black PVD or brown PVD coated mid steel case.